Add and vote for your favorite restaurants! Howdy? Followed by the recent change of GoEatOut Design, now we have added a link button for you to add your favorite restaurants into a list. You will be able to see your favorite restaurants in your profile dashboard. Btw, you will need to login to GoEatOut in order to use this features. Try it out here and let us know what do you think. GoEatOut has a whole new look! Although there are still some limitation due to our core CMS platform, we are still able to reduce half the rendering speed compared to the previous design. (Averagely, we reduced 250Kb of page sizes). This new design also aimed to reduce noises by taking out some elements and make the look much cleaner than before. 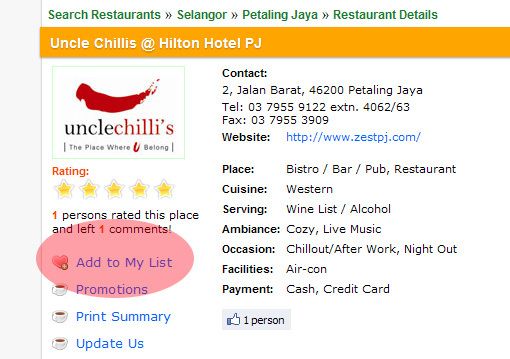 This would help visitors to search for dining promotions and restaurant details in a quicker way. Other interactive functions such as Facebook “Like” and “recommend” button were added as well. We will adding other features like “add to favorite” and a brand new map as well. Please tell us what do you think about the new look! We’re excited to give you more and your feedback will help us make a better food portal for Malaysian!